Aaron Hughes is the current editor of Method and Theory in the Study of Religion and has generously agreed to talk with the Bulletin about his recent appointment and vision for the journal. He is professor of Religion, Jewish Studies, Islam, and Method and Theory in the department of Religion and Classics at the University of Rochester. Professor Hughes’s books include: The Texture of the Divine (Indiana University Press, 2003), Jewish Philosophy A-Z (Palgrave, 2006), The Art of Dialogue in Jewish Philosophy (Indiana University Press, 2007), Situating Islam (Equinox Publishing, 2007), The Invention of Jewish Identity (Indiana University Press, 2010), Defining Judaism: A Reader (Equinox Publishing, 2010), Abrahamic Religions: On the Uses and Abuses of History (Oxford UP, 2012), and the forthcoming The Study of Judaism: Identity, Authenticity, Scholarship (SUNY Press, 2013), and Rethinking Jewish Philosophy: Beyond Particularity and Universality (Oxford UP, 2014). Matt Sheedy: Could you tell us a little about yourself, your research interests, etc., and how these experiences have shaped your approach as an editor? Aaron Hughes: The pleasure is mine. Thank you for wanting to talk with me. I’ll take a nod from Aristotle and work on the assumption that history is only interesting if repeatable or if others can see themselves reflected therein. I am from Edmonton, AB, and was attracted to religious studies probably for the reasons that many of us were: I found the study of religions different from my own to be fascinating and, in many ways, liberating. I still remember when I was a first-year undergraduate and being mesmerized by the PBS series with Joseph Campbell and Bill Moyers on the power of myth. (I think today, however, that my take would be somewhat different!) I studied religious studies at the University of Alberta in the early 1990s, and the faculty in the department there was composed of two different and distinct types: (1) phenomenologists who had been trained in the History of Religions program at the University of Chicago; and (2) those who were informed by a different set of theoretical issues that emerged from, for example, continental philosophy, psychoanalysis, and literary criticism. This was, although I had no idea of it at the time, fairly typical of most departments of religious studies throughout North America during these years. My interest in disciplinarity, meta-questions, and theory – though I doubt I would have framed it in this manner at the time – was deeply informed by my experience as an undergraduate. I remember taking a full-year “Theories” class with an eccentric and now deceased Japanese professor, Manabu Waida, who had studied History of Religions at Chicago with Kitagawa and Eliade (he even had big framed pictures of them on his desk). He would always talk about the “irreducibility of the sacred,” and we must have spent a good three months reading, in agonizing detail, Eliade’s Patterns in Comparative Religion. Although I say “agonizing,” this is perhaps me looking back from the present. To be fair, I was intrigued and his vision – at the time, however, I don’t think I realized just how problematic it was – was inspiring to me. It was not Eliade’s book that I found to be the most interesting in the class, however. I was most attracted to Weber’s Sociology of Religion, especially after it became clear to me what he was doing or trying to do therein. The idea of taking a question – the emergence of rational bourgeois capitalism – and using it as the prism with which to look at, and compare, various religions was fascinating. This was not the kind of essence/manifestation model seen in the likes of Eliade, but something entirely different. But the individual that left the biggest impression on me as an undergraduate was a professor of Jewish Studies, and now my good friend, Francis Landy. We would read Jewish texts together – Bible, Talmud, works in Jewish philosophy and kabbalah – and his interest was in wrestling with these texts, trying to figure out what they were saying (and not saying), and how they were full of indeterminacy and multivocality. We would read, in good Jewish fashion, these texts closely, in dialogue with one another, and, when possible, in their original languages. I began to find this sort of close textual and imaginative work more interesting and meaningful at the time than I did the explicitly theoretical work of religious studies. When I applied to go to graduate school, I had no idea of what I was doing. As a first generation college student, it seemed like an indulgence, but I loved learning so much! When the dust settled I found myself starting an MA program at Indiana University in Bloomington (and a little bitter that not a single Canadian program thought I was worthy of funding). It turned out to be an excellent fit. It enabled me to work on the three areas that I now actively publish in: Jewish philosophy, Islamic Studies, and theory and method. Graduate school for me was primarily about language work in Arabic and Hebrew. While I had begun both as an undergraduate, they now occupied a lot of my time and energy. Luckily I had an advisor who believed (correctly!) that one could not work in medieval Judaism and Islam without a solid grounding in Hebrew, Arabic, and the theological/philosophical histories of both traditions. I was, thus, firmly grounded in two different religious traditions. And, because of my temperament, the various theoretical models supplied by religious studies provided the means by which I tried to situate them and their complex interactions both in my own mind and in my writing. The program at Indiana was so amenable to my intellectual growth that I decided to stay there for my PhD. During these years, I actually spent more time away from Bloomington – at the Hebrew University in Jerusalem and at the Bodleian Library in Oxford – than I did in it. My dissertation (published as Texture of the Divine: Imagination in Medieval Islamic and Jewish Thought [Indiana UP, 2004] enabled me to combine all my areas – Islamic Studies, Jewish Studies, philosophy, and theoretical questions – in ways that, in retrospect, I am quite pleased with. After a year teaching at Miami University of Ohio, I went to the University of Calgary in the summer of 2001. It was a move that, in hindsight, was bound to end in frustration. Although at the time my primary area of interest was in Jewish Studies, I was hired there as an Islamicist. My experiences there proved formative: (1) my first week on the job was the week of 9/11; and (2) my colleagues there were absolute luddites, if not downright hostile, when it came to theory. Being the contrarian that I am I began to engage in and think about theory quite a lot, and I felt that the best data to use was the discourses then being actively created by those in Islamic Studies after 9/11 to apologize for the tradition (e.g., “Islam couldn’t possibly condone…”). Here I have to single out Russell McCutcheon for encouragement to develop this further and not just rant about my frustrations whenever I saw him. The immediate result of this was my Situating Islam: The Past and Future of an Academic Discipline (Equinox, 2007) that appeared in his series. I guess the rest is history. Since then I have published actively in Judaism, Islam, and theory. Sometimes these three areas overlap (e.g., my Abrahamic Religions: On the Uses and Abuses of History [Oxford UP, 2012]; my forthcoming The Study of Judaism: Identity, Authenticity, Scholarship [SUNY Press, 2013]); other times, they don’t (e.g., my The Art of Dialogue in Jewish Philosophy [Indiana UP, 2007], and my forthcoming Rethinking Jewish Philosophy: Beyond Particularity and Universality [Oxford UP, 2014]). When I was approached to be the Editor of MTSR in 2012 I was working in a History department at SUNY, Buffalo. Although earlier in my career I had tried to make the case that religious studies is an artificial discipline, predicated as it is on the reification of an amorphous concept (“religion”), being in a History department made me wistful for a return. I realize, though, that this might just have been due to the fact that I found myself in a rather flat-footed and border-patrolling department. I would certainly hope that other departments of History would not share the unfortunate myopia of this department. After this rather long-winded and meandering narrative, I now find myself ensconced in the present: back in religious studies, as Editor-in-Chief of MTSR, and on the verge of becoming a senior (!!) scholar. How have these experiences shaped my approach as an editor? I hope it should be clear from what I have said, but let me try to tease them out a little. While in graduate school, I thought that everyone was interested in issues of theory and method, but when I got to the University of Calgary I realized, to my amazement, that this was not the case at all. (This, of course, is also reinforced by a quick perusal of any AAR annual meeting program book.) The faculty there was so mistrustful and openly hostile and this mistrust and hostility had, unfortunately, seeped into the graduate students. No one was interested in theorizing their data or asking questions about the genealogy of the categories that they employed. They simply wanted to be left alone. Their “data,” for them, existed naturally in the world and they wanted to describe it for all and sundry. I find this – the assumption that our language and its categories do not admit of distortion – just ludicrous. I am, thus, very interested in receiving submissions to the journal that reflect upon how data is created, formed, imagined, and manufactured. Although my own work puts a high priority on language and texts, my goal is to publish pieces in MTSR that cannot be published elsewhere because they emphasize questions of theory over questions of data, and issues of analysis over those of description. In this regard, I envisage MTSR as the anti-JAAR. I am not interested in description, theology (crypto or any other variety), or ecumenicism. If someone has written something on theory and method (regardless of whether they are a member of NAASR) I want MTSR to be the first journal that pops into their heads for places to submit. I’m not there yet, but, with each new issue I produce, I hope that slowly and gradually this will be the case. MS: You mention that you envision MTSR as “the anti-JAAR,” and that you’d like MTSR to be the first journal that scholars think of when they’re considering submitting an essay on theory and method. While it is certainly the case that JAAR is committed to publishing both theological and non-theological voices in its pages (see Philip Tite’s interview with current JAAR Editor Amir Hussain) and does not dedicate itself to the interrogation of, as you put it, “how data is created, formed, imagined, and manufactured,” it does contain essays that take a social scientific approach and even some (and I would argue increasingly so) that seek to theorize their data. While it may be entirely speculative, do you think MTSR has had a role in helping to change the conversation toward a greater inclusion of these concerns in the field, even in the pages of JAAR? Lastly, do you think, perhaps, that MTSR could be viewed less an “anti-JAAR” and more of a contrarian family relation (however uncompromising) who might act as an ally in disguise by helping to keep it honest (i.e. critical)? Having said this, however, it becomes necessary to articulate that I, and others in the field, understand MTSR as the journal for method and theory in the academic study of religion that is produced on a consistent and uncompromising basis. The AAR has such a diverse and large audience that method and theory as I defined it above will only ever be a niche or specialized market there. I cannot tell you how many articles I have received from potential authors that tell me that the JAAR rejected them because they “did not reflect the AAR’s diverse readership.” Some of them are very, very good and will, in coming issues, appear in MTSR. So the issue is neither nearly as straightforward nor as transparent as it may appear on the surface. Certainly the JAAR will publish the occasional piece on the types of issues that interest MTSR readers (I think of the very good special issue last year devoted to an essay by Wiebe and Martin; or McCutcheon’s frequent rejoinders). And I am certainly glad that they do. But I would have to say that such articles are definitely the minority. Indeed, they have to be given the AAR’s various and manifold interests. 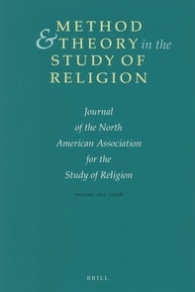 I don’t have the numbers, but I would like to venture anecdotally that something in the range of 85-90% of the JAAR’s contents in any given issue is devoted to data description or why and how the academic study of religion should make room for constructive theology. I certainly have nothing wrong with this (well maybe I do), because, again, such contents reflect the AAR’s membership. But when the JAAR presents itself as the place for theoretical and methodological issues in the way that MTSR understands these terms, then I begin to get bugged. If MTSR nudges AAR types to become more sophisticated when it comes to theory and method, excellent. However, this is not my concern. My concern is turning out consistently good issues by individuals who put issues of theory and method at the forefront of their analyses for others who think the same way. This entry was posted in Interviews, Theory and Method, Uncategorized and tagged AAR, Aaron Hughes, Francais Landy, JAAR, Joseph Campbell, Method and Theory in the Study of Religion, Mircea Eliade, Russell McCutcheon. Bookmark the permalink. Is there no method or theory in constructive theology? I would hope so. If you’re interested I’d suggest you look at HTR, JRE, JAAR, Religious Studies, Religion, and countless other journals devoted even more explicitly to Theology. MTSR seeks to caarve out space for these topics in the (non-theological) academic study of religion. Thanks for reading. I guess I wasn’t clear: the question was rhetorical. Your comments in the article seems to imply that method and theory and constructive theology are basically opposed, which is an assumption that seems all too common in my experience with the NAASR/MTSR crowd. What if they’ve written something on theory and method in theology? Well, now you don’t want MTSR to be the journal that pops into their head, because you’re not interested, even though it’s theory and method.